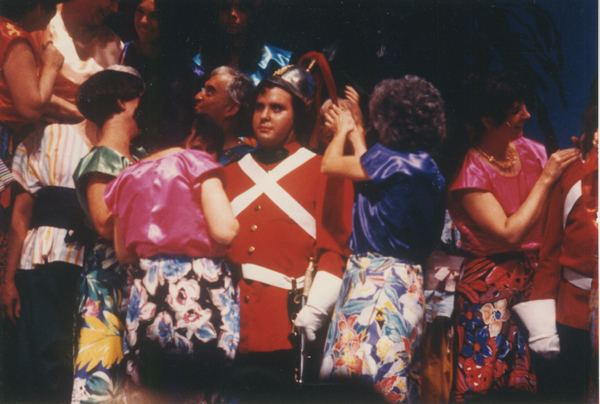 Next month I will be joining a rare class of musician: someone who has performed in three different productions of Gilbert and Sullivan’s late masterwork Utopia, Limited. I will be performing the speaking role of Calynx, the Utopian Vice-Chamberlain. 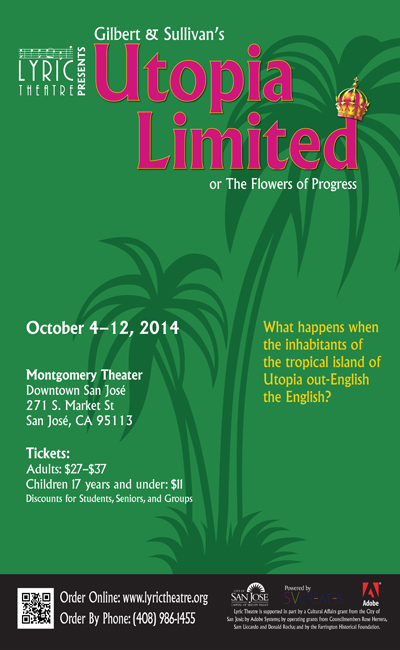 Our production at Lyric Theatre of San José has 6 performances on October 4 – 12, 2014. Tickets are available online. Utopia, Limited is not often done – this is Lyric Theatre’s first performance in 18 years. It had a successful opening run at D’Oyly Carte but wasn’t revived for more than 80 years. If it’s so good, why is it done so rarely? In part it’s because it is an expensive show to do. There’s a big cast with 18 roles and lots of exotic costumes. The plot lacks the topsy-turvy aspects of earlier shows, something that I rather like but that may not meet some audience expectations. The lack of D’Oyly Carte performance history also fed on itself, something that only started to really turn around after the show was first recorded in the 1970s. Perhaps the greatest issue was that Gilbert’s satirical targets may have been ahead of his time. He had taken aim at British government before, though perhaps not so broadly. In Utopia though his most notable targets were capitalism – specifically limited liability companies – and imperialism. The name Utopia, Ltd. reflects how a South Pacific monarchy becomes a corporation, and then extends the concept of limited liability to individuals. That may have seemed an obscure satirical target to a British 1890s audience, but in the present-day USA where legal decisions break down the divide between corporations and people, and we go through surges of dot-com booms and busts, it has more resonance. There is also the satire of cultural imperialism, where a South Pacific culture decides to embrace English culture to such an extant that they race to outdo the English. I think this type of satire has had great resonance for American audiences since the 1960s. What once were liabilities are now boons. I think that the satire in Utopia has remained more timely and on point for contemporary audiences than that of any other G&S show. And the music is glorious! My favorite moments come in Act II, with the a cappella chorus “Eagle High” and Lady Sophy’s beautiful aria “When But a Maid of Fifteen Year”, accompanied by some of the most wistful bassoon music you’ll ever hear. So after a 26-year break, here I am performing Utopia for a third time. This time I am cast as Calynx, a speaking role that appears in the first scene of the opera. His is the first male voice you hear in the show, just as Francesco was in The Gondoliers when I sang that role with Sudbury in 1991. Like Francesco, during the rest of the show I sing with the chorus. Phil Lowery is directing this show and I love his production ideas, including how we’re handling the drawing room scene. Jeff Yaeger is conducting; I played with his father Robert in the Utopia orchestra in San Jose back in 1979. If you’re in the San Francisco Bay Area during the first 2 weekends of October, do yourself a favor and come see this production of a wonderful, rarely-done Gilbert and Sullivan opera. Performances are October 4, 5, 9, 10, 11, and 12. The Sunday performances are 2:00 pm matinees and the rest are 8:00 pm evening performances. All performances are at the Montgomery Theater in downtown San José, an intimate theater similar in size to the Lucie Stern Theatre where I usually perform with West Bay Opera. More ticket information is available online. This will be my first time performing at the Montgomery after seeing many productions there and I’m really looking forward to it. I hope to see you there! This entry was posted in Music, Opera, Theater. Bookmark the permalink. Congratulations on “Utopia.” It is a marvelous production! I really enjoyed it. Would it be possible for you to send me an email? I want to ask you a favor regarding one of the great photos in your article. Thank you. Have fun this weekend with the show! i just happen to google moms name today and came across this blog. Wow! Thank you! 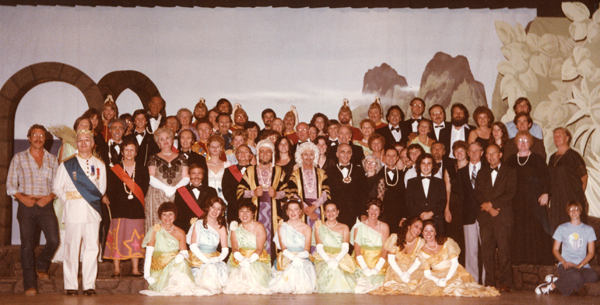 So many of that cast is no longer with us, including my mom. She passed in december 2013.